Composer(s): Richard Mills, Andrew Schultz, Graeme Koehne, Ross Edwards, Colin Brumby, Sir George Thalben-Ball, Alfred Hill, Phyllis Batchelor, Fritz Hart, Percy Grainger. Gothic Toccata is one of the most significant organ recordings to have been released in Australia in the past quarter of a century. It includes several world premiere recordings (denoted by *). 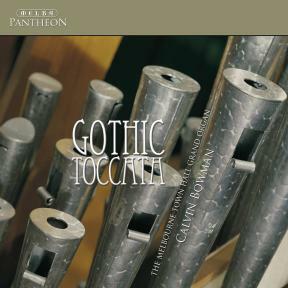 It is the first major recording of Australian organ works on an important Australian instrument. Pieces from the early twentieth century until the present day showcase the diversity of styles and the plethora of colours which the Town Hall organ is capable of producing. Drawing on an enormous tonal palette, Calvin Bowman has carefully chosen registrations to suit each of the works in question. The Melbourne Town Hall Grand Organ is an outstanding instrument for music which is orchestral in effect (Hart), for transcriptions (Hill, Grainger and Batchelor), music which requires great clarity in terms of registrations (Brumby and Mills), and sheer unadulterated power (Schultz and Koehne). The Melbourne Town Hall organ is one of the largest in the world. Built in 1929, it was entirely rebuilt in 2001 and relaunched by Calvin Bowman with a work by Philip Glass in the composer’s presence. Eight world premiere recordings are included on the disc. Significant works by Fritz Hart, Alfred Hill, Phyllis Batchelor, Colin Brumby, Ross Edwards, Richard Mills and Andrew Schultz are being released commercially for the first time. This is the first CD recording of the instrument using Direct Stream Digital (DSD) technology, yielding the highest possible master quality and is ideally suited to reproducing the wide dynamic range and tone colours of the different organ divisions. Richard Mills, Andrew Schultz, Graeme Koehne, Ross Edwards, Colin Brumby, Sir George Thalben-Ball, Alfred Hill, Phyllis Batchelor, Fritz Hart, Percy Grainger. Following a disastrous fire in 1925 which destroyed the Melbourne Town Hall auditorium and its original 1872 organ, the City of Melbourne commissioned a new grand organ for its new and enlarged hall. This organ, built by the British firm Hill, Norman & Beard, was opened by the then city organist Dr W.G. Price in July 1929. Much of its mechanism was ‘state of the art’ at the time. The organ served the city well for more than sixty years, but by the 1990s it had become unreliable to play and part of its fabric damaged. When the hall was being refurbished in the late 1990s, the City of Melbourne took the bold decision to rebuild and update the organ. The contract was awarded to the Schantz Organ Company of Orrville, Ohio, USA in 1997. At a cost of AUD4.2 million the 1929 organ was lovingly restored and many of its original deficiencies met with new stylistically appropriate additions including over forty new ‘voices’ such as the brilliant horizontal Trumpet Victoria. With over 160 speaking stops in total, it is now a shining example of an English romantic grand organ. The original facade of Queensland maple with its two huge coin bronze grilles and its twenty-nine metal pipes has been retained. The addition of a mobile console on the floor of the auditorium has not only brought the organist closer to the audience but has allowed new types of performances to take place. The interior of the organ is now accessible to the public by a series of walkways and visiting tour groups can see the grand organ at work and visit the Organ Historical Museum located backstage at the Melbourne Town Hall. For the re-launch of the organ on 25 May 2001 the City of Melbourne commissioned Philip Glass to write a new work. The composition, titled Voices, was written with Aboriginal didjeridu virtuoso Mark Atkins. It featured the organ, two didjeridus, clap sticks and a narrator. Calvin Bowman was the organist on this occasion. The City of Melbourne presents a wide range of events showcasing the organ as both an historic and a modern instrument, featuring Australia’s finest organists and many celebrated international performers. The free ‘Organic Lunch’ concert series, running since December 2003, is very popular. Other activities have included screening films with live improvised organ accompaniment, master-classes with visiting international organists and the commissioning of new compositions by young Australian composers. In 2005 and 2007 ‘The Necks…Piped’ brought a minimalist jazz sound to the organ and in 2006 ‘The Current’ expanded the Grand Organ program with a multimedia interactive event that toured the Town Hall building.